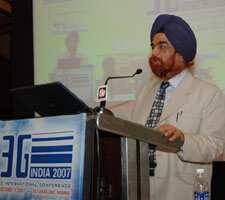 New Delhi: Combination of mobile and TV would be the next big event in cell phone growth, Biswadeep Mitra, managing director, Texas Instruments - India said at the 3G India 2007 International Conference on 11 October. He said mobile phone users would soon be able to get high-definition TV on their handsets due to TI research’s development of OMAP, an application processing engine. They would also have 8-mega pixel cameras on handset enabling camcorder facility. In response to a query from operators, Grover said he didn’t agree with those operators who think of spectrum crunch as an impediment. “Customer expectations from the mobile phone are very high and rising. Operators have to rise to the occasion" he cautioned. Enhanced services through 2.5 and 2.75 G networks offer customer-rich experience that is closer to 3G. New gateways for these could be installed right away to make efficient use of resources. The gateways would also enable the movement to 4G, which has already overtaken 3G, Grover pointed out. Even higher data rates on 3G services are now possible with further enhancements available on W-CDMA platform, said Alcatel-Lucent, CMO, A. Sethuraman. He said both 3G and Wi-Max can co-exist as CDMA and GSM are rapidly developing new enhancements that would lead to a single platform with multi-media experience on the mobile phone, he said. Asking operators to zero in on aspiring young people as the most eager customers of enriched mobile services, Airtel senior vice president Abhay Savargaonkar said latest developments must be incorporated when the 3G services are introduced. Handsets were already available with these enhanced high data rates. For operators who are facing falling average return per user at a time when they have to extend service to greenfield areas like rural customers, focusing on some 124 million aspirational sections of the young population would help. Home office and small and medium businesses are also increasingly using mobile services. Describing 3G services as an “unique platform" MTNL executive director J. Gopal spoke of the immense possibilities that the service would open up. In several areas 3G was uniquely positioned to provide the right platform. MTNL was growing into video-based services company.